I have never understood how someone could dislike eggplants. They are, to my mind, one of the most amazing vegetables (though they are technically a fruit) around: creamy when fried or slow-cooked, chewy when grilled, meaty when roasted… And the flavor itself is nothing short of miraculous in the summer, when the markets are filled with eggplants in every shade of purple and white, some plain, others streaked zebra or graffiti. I adore eggplants, and I believe anyone who says they don’t like them has never tasted a truly good specimen. 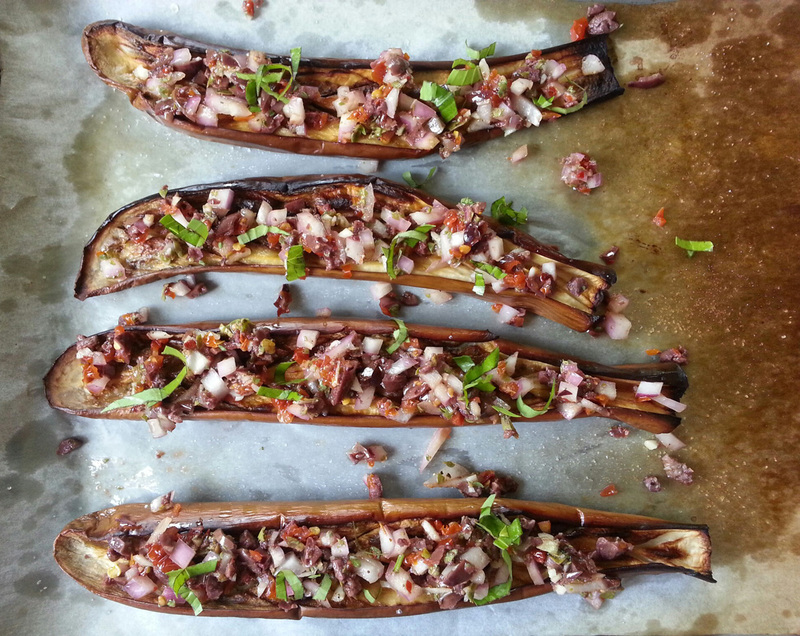 Here is one of the simplest ways to enjoy eggplant. I borrowed the flavors for the salsa from one I tasted in Liguria, but made mine bolder by adding raw onions and a touch of chili. If you favor more delicate flavors, top the eggplant with the salsa halfway through baking so it loses its direct potency, and finish with tiny dice of fresh Mozzarella when serving. Chinese eggplants (and Japanese eggplants, which are quite similar) are slender and long, with few seeds and a sweet flavor. They have a thin skin, cook through faster than Western varieties, and are a good starter eggplant for anyone with a timid palate. Japanese eggplants are darker in hue than Chinese, and will work just as well in this recipe; use whatever variety looks good at the market. 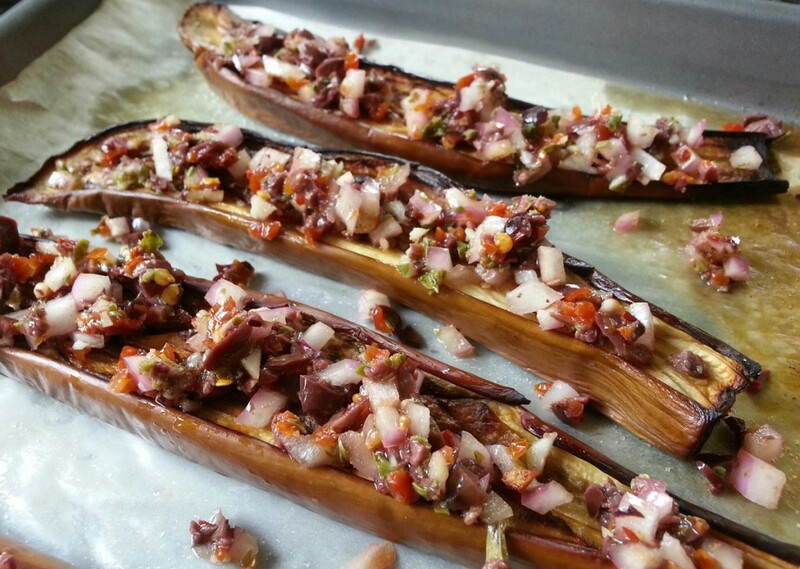 Make the eggplants: Preheat the oven to 350 degrees (preferably set on convection bake). 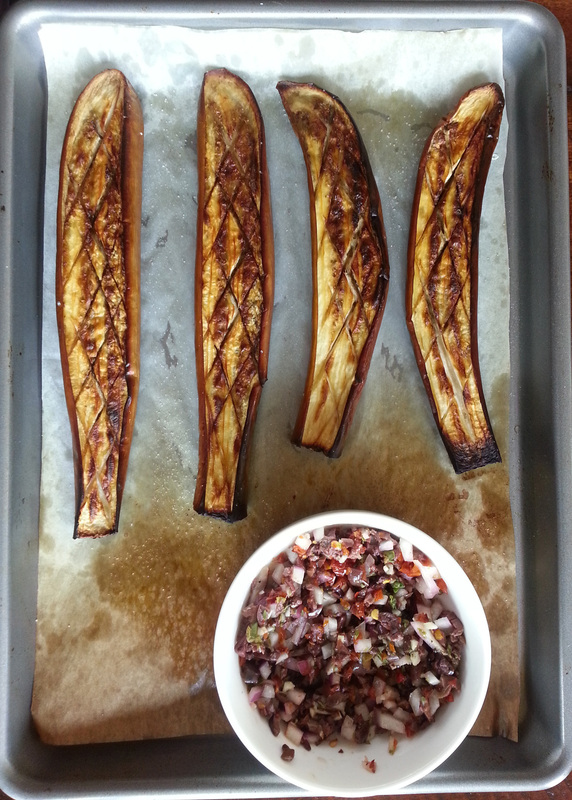 Lay the eggplant halves, cut side up, on a parchment paper-lined baking sheet. Cut a cross-hatch pattern into each eggplant half, barely scoring the flesh. Brush with the olive oil and season with the salt. 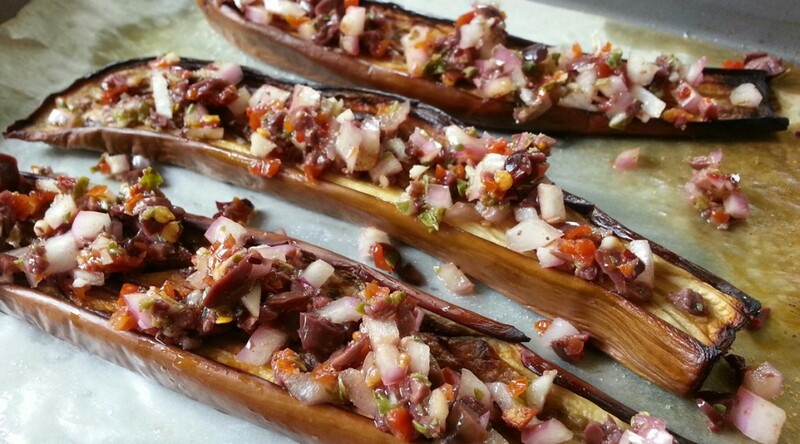 Roast in the preheated oven 30 minutes, or until tender and creamy when pierced with a knife; the eggplants should still hold their shape. If using western eggplant varieties, the cooking time will be longer. Make the salsa: In a medium bowl, mix all the ingredients and taste for salt. Adjust as needed. To serve: Spoon the salsa over the warm eggplants and serve. My mom made this refreshing salad often when I was growing up; I’m not sure where she got the inspiration, because the ingredients are hardly typical of Italian cooking, but it was one of my favorites as a child. 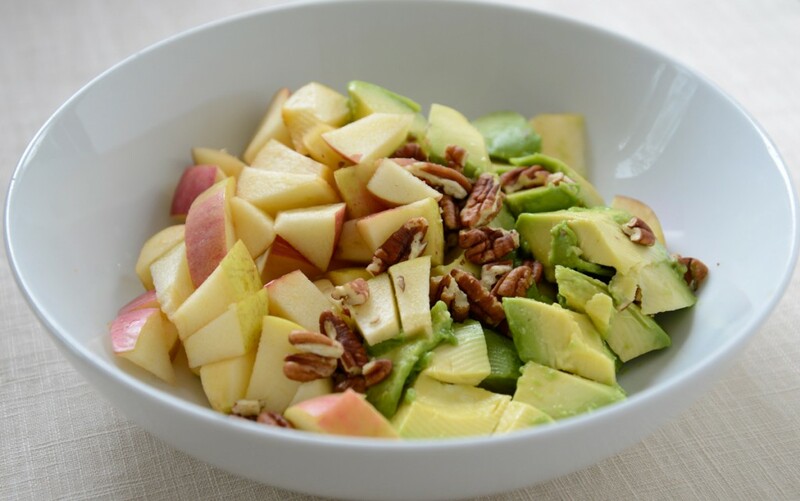 It takes just a few minutes of work (mostly scooping the avocado out of its skin) and delivers surprising flavor: the sweet, juicy apple plays off the rich, creamy avocado beautifully, and the pecans tie the two elements together. Serve the salad within an hour of tossing it, or else the avocado will darken and the flavors meld rather than remain distinct. If you have any leftovers (doubtful), lay a piece of plastic wrap directly over the salad to prevent darkening. In a large bowl, gently mix all the ingredients. Taste and adjust the seasoning if needed. Refrigerate up to 1 hour prior to serving. Cooks in the Italian countryside often make simple crespelle (the Italian word for crepes) with flour and water only, no eggs or milk or fats added. The result is a slightly chewy, hearty wrapper that best encases sharp cheeses such as Pecorino, or a thin slice of salty Prosciutto, or, as below, a garlic-laced vegetable filling. 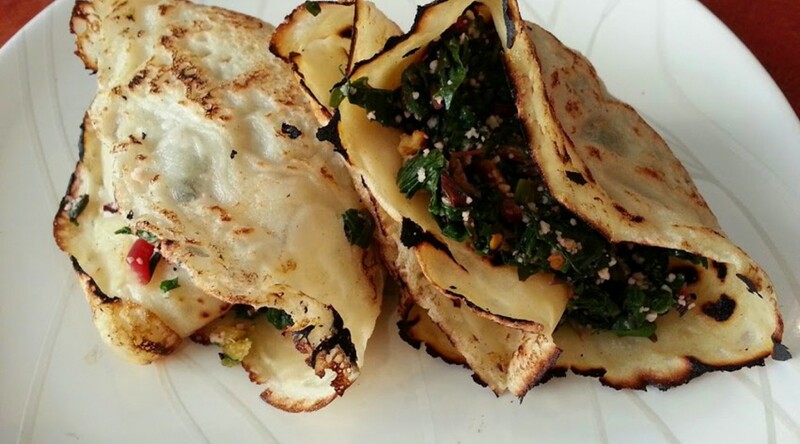 I serve these crespelle as a vegetarian main course when I am inspired by the greens at the market; broccoli raab, Swiss chard, spinach, beet greens, or escarole all work well. You can even combine a few different greens to obtain a more complex flavor. 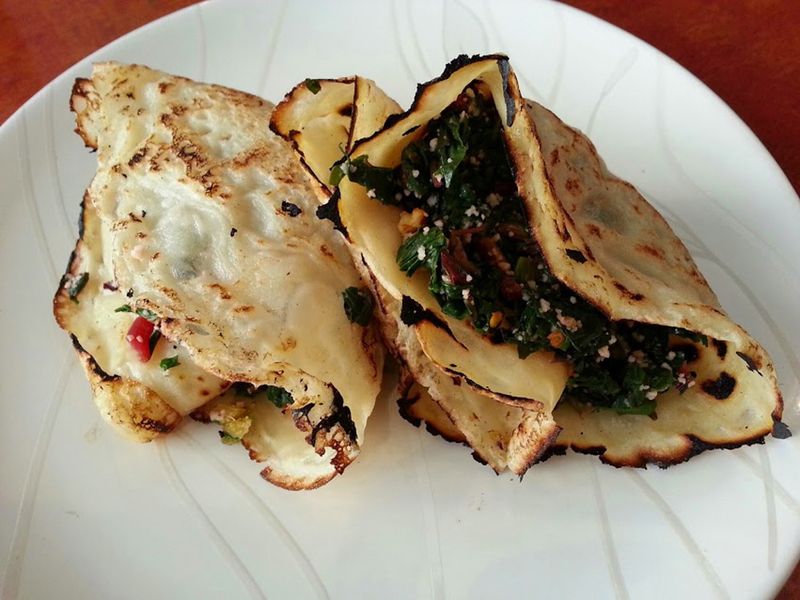 The crespelle can be made up to 12 hours ahead and kept covered with plastic wrap at room temperature until needed. Leftovers can be refrigerated up to 2 days in a tightly sealed plastic bag, but my guess is, there won’t be any leftovers once you try these! Make the crespelle: Sift the flour and salt into a medium bowl. Whisking all the while, beat in enough warm water (about 1 cup) to make a smooth, fluid, fairly thin batter that flows like heavy cream. Strain through a sieve into a clean bowl. Heat an 8-inch round cast iron or nonstick skillet over high heat. Brush very lightly with some of the olive oil, and pour in about 1/4 cup or so of the batter (measure first, but use a ladle to spoon it into the pan for ease), tilting the pan immediately to spread it all the way to the edges. (If the batter does not spread easily, thin it out with additional water.) The batter should barely cover the base of the skillet, or else the crespelle will be too thick and therefore tough. Cook 3 minutes, or until lightly crisp around the edges and spotted lightly on the bottom. Turn and cook the other side for 1 minute, or until lightly speckled with brown spots. Remove to a plate; continue with the remaining batter, making (ideally) eight crespelle in all. Make the filling: Bring 2 quarts of water to a boil. 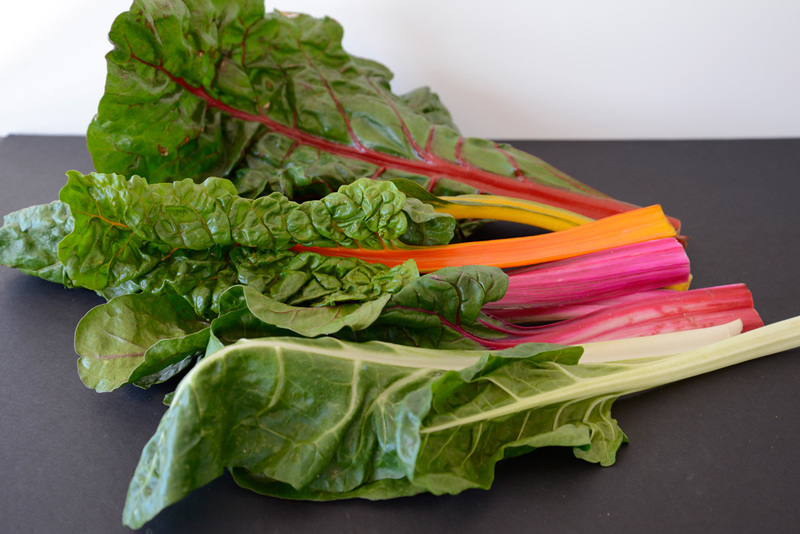 Add 1 tablespoon of the salt and drop in the chard leaves. Cook 5 minutes, or until soft. Drain, cool under running water, and squeeze dry. 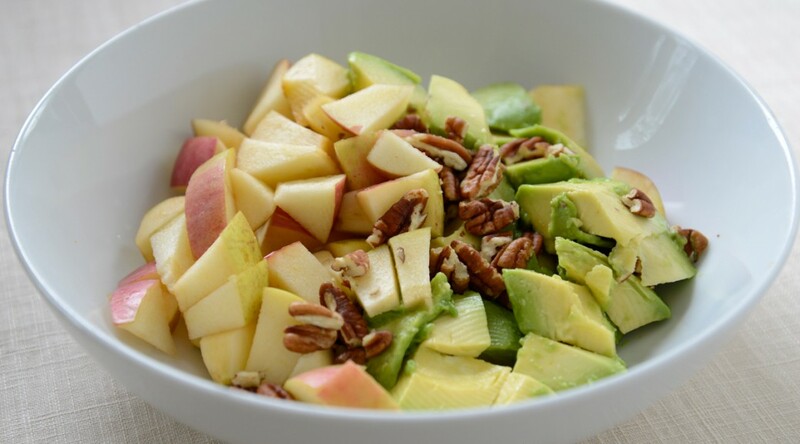 Chop finely and place in a bowl. Add the remaining 1/4 teaspoon of salt, the garlic, chili, olive oil, and Pecorino. Stir well and taste for seasoning; adjust as needed. 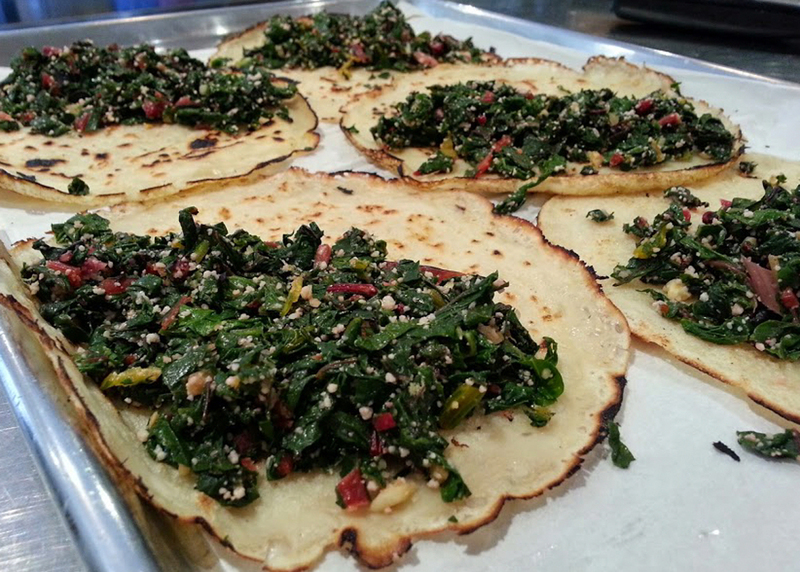 Arrange the crespelle in a single layer on a tray. Top evenly with some of the filling, fold into quarters, and enjoy. The season for squash blossoms is almost over: we may have another few days or so to enjoy these colorful flowers. 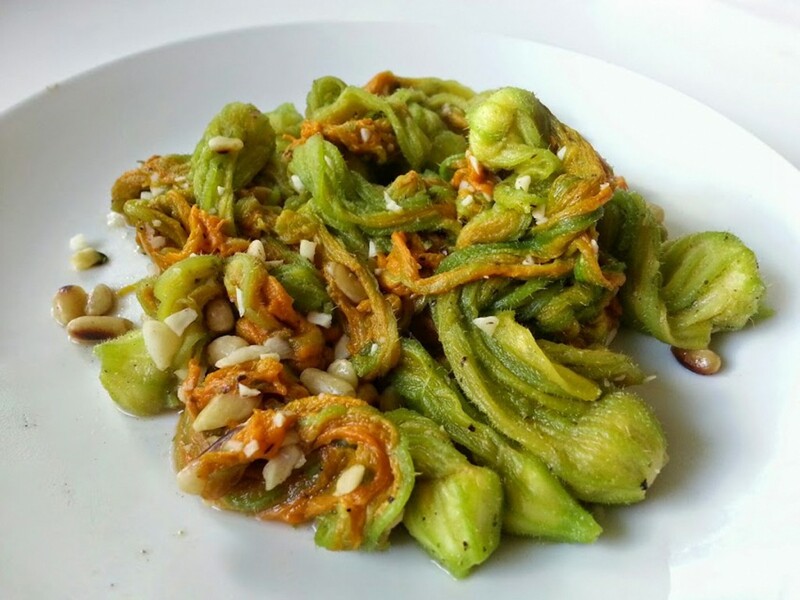 In Italy, squash blossoms are often deep-fried, sometimes stuffed with fresh cheese and anchovies, enrobed in a light batter before they crisp to golden perfection in hot olive oil. But they are also stirred into pasta sauces, added to frittate, dragged in a hot pan with aromatics as a side dish, or baked under a dusting of grated Parmigiano. I love squash blossoms every which way; their delicate floral sweetness is haunting, the romance of eating a flower only part of the pleasure. 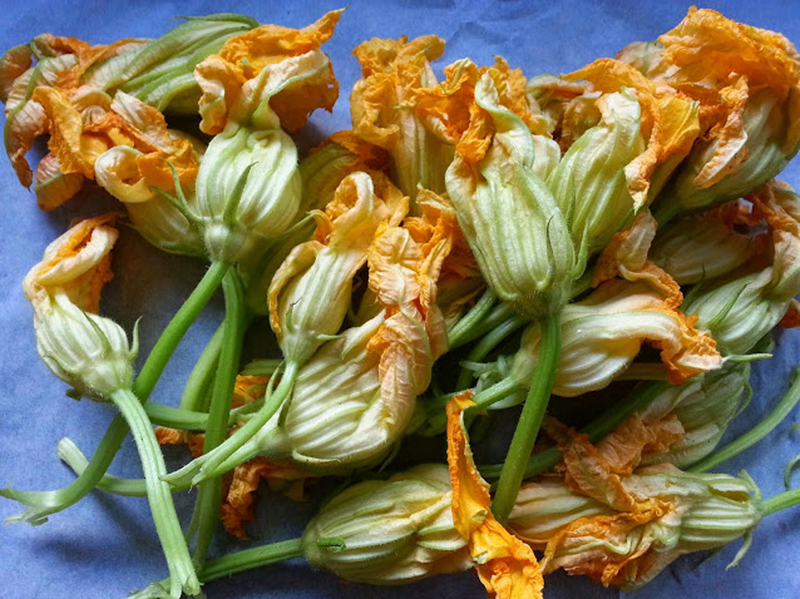 Here is the way I prepared squash blossoms last week, after a trip to a nearby farmer’s market. We grow marjoram on our deck, but basil or parsley would be equally delicious if marjoram is hard to find. To stretch the pleasure, serve the blossoms with fresh tagliatelle you’ve boiled and tossed with olive oil and grated Parmigiano: delicious. 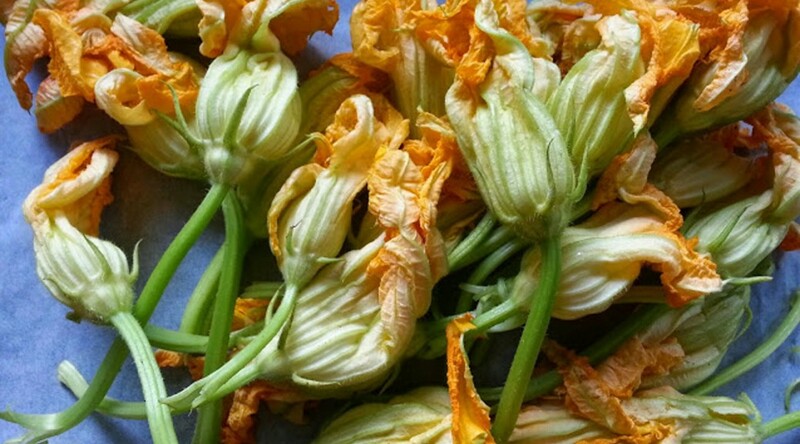 One word of advice: squash blossoms are very delicate, so buy them the day you plan to cook them. Rinse the blossoms thoroughly under a thin, light spray of cool water, gently opening out the leaves and running your fingers inside each blossom to remove any small insects. Using your fingers, remove the hard long stem inside each blossom. It is bitter and must be removed. Remove the thin thorn-like filaments running up from the bottom of each blossom, just above where the stem ends. Cut off the stem at the bottom of each blossom, just where it meets the bud (be careful not to cut it too high or you will make a hole in the base of the blossom). Blot the blossoms dry on paper towels. Place the olive oil, garlic, pine nuts, and marjoram in a 12-inch skillet. Set over medium heat and cook until the aroma begins to rise, about 2 minutes, watching that the pine nuts do not burn and stirring as needed. Raise the heat under the skillet to high. Add the blossoms and cook 3 minutes, or until they wilt to a soft, tangled mass and any liquid has evaporated. Season with the salt and pepper, taste for seasoning, and serve hot.